Fruity & zesty. A refreshing taste of summer. Made for you on our farm. No preservatives, flavouring or anything artificial. 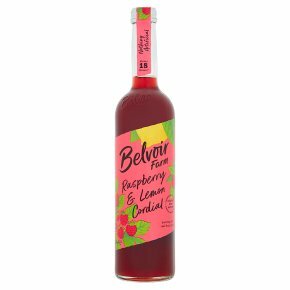 Non-alcoholic.A true taste of summer with real pressed raspberries blended with freshly squeezed lemon juice for a refreshing fruity taste. Dilute about 1:8 to make 18 glasses (250ml) of lovely refreshing drink. Only 50 calories per glass. Made with lots of lovely real juices that may separate overtime, please shake the bottle before use.